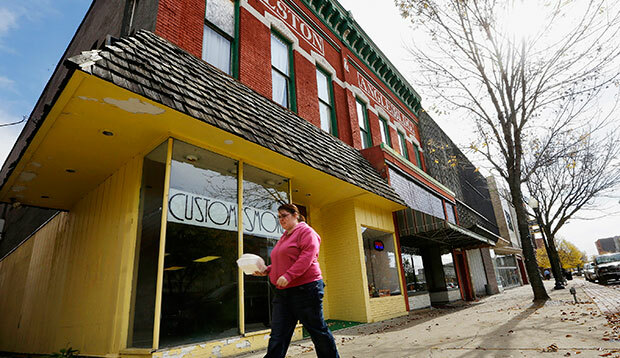 On Wednesday, the Bureau of the Census will release its 2014 numbers for the most widely used barometer of middle-class financial health—median incomes. We expect real median income to have grown between 2013 and 2014, but even one year of robust growth likely would put the Census’ published number well below its 2000 level. Nevertheless, several analysts have argued that technical and conceptual issues with the published median income numbers understate middle-class income growth. We analyze their arguments and find that journalists and policymakers can safely use the published Census data for an accurate picture of middle-class income growth without worrying that the decline is a result of an aging population or of another technical issue. Using three different data sources, we also show three important facts about the U.S. income distribution that policymakers should focus on: Market middle-class incomes have declined since 2000; market middle-class income growth has slowed since 1980; and the share of income going to the top 1 percent has exploded. Heritage Foundation Research Fellow James Sherk, in criticizing a Washington Post series on the “lost middle-class” that used Census data, accused the paper of making “several mistakes,” which “make the middle class today seem poorer than it actually is.” Most recently, Harvard professor and Reagan economic advisor Martin Feldstein wrote that “the political debate is distorted by misleading statistics that grossly understate” middle-class income gains. Sherk and Feldstein argue that data from the Congressional Budget Office, or CBO, paint a more accurate picture of middle-class income growth for two reasons. 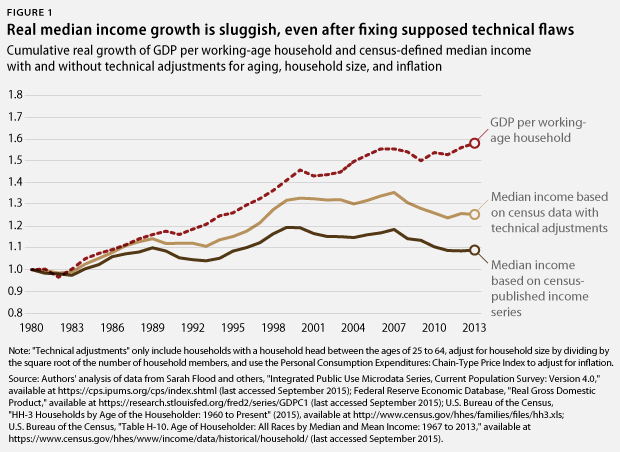 First, the CBO data fix some technical shortcomings in the published median income series. Second, they use a more expansive concept of income that includes the effects of taxes and noncash transfers from the federal government—such as nutrition assistance—and from employers—such as health insurance. It is important to note, however, that their main technical criticisms of the published median income series do not change the qualitative picture. Sherk and Feldstein argue that part of the reason middle-class incomes have grown so slowly in the Census data is that they fail to adjust for aging and declining household size while using an inflation index that overstates inflation, since higher inflation causes real incomes to grow more slowly. Figure 1 below displays the published median income series and an adjusted series that only looks at nonelderly households, uses a standard adjustment for household size, and uses an inflation index that indicates slower inflation. This adjusted series still shows that median income declined by 6 percent between 2000 and 2013. In other words, the failure of middle-class incomes to grow since 2000 is not a result of these technical shortcomings. As we argued in a previous column, a closer look at the more expansive CBO definition of income preferred by Sherk and Feldstein shows that the entire increase in middle-class incomes since 2000 came from federal tax cuts and transfers—mostly from the value of Medicare and Medicaid insurance. In other words, market incomes failed to grow. Raising middle-class market incomes is a critical challenge that conservatives should embrace as progressives have: Without market income growth, the only way that policymakers can directly increase middle-class net incomes is through some combination of raising taxes on the wealthy or deficit spending. There is no single best data source for studying middle-class incomes or the U.S. income distribution; analysts should choose their data sources based on the specific question they seek to answer. 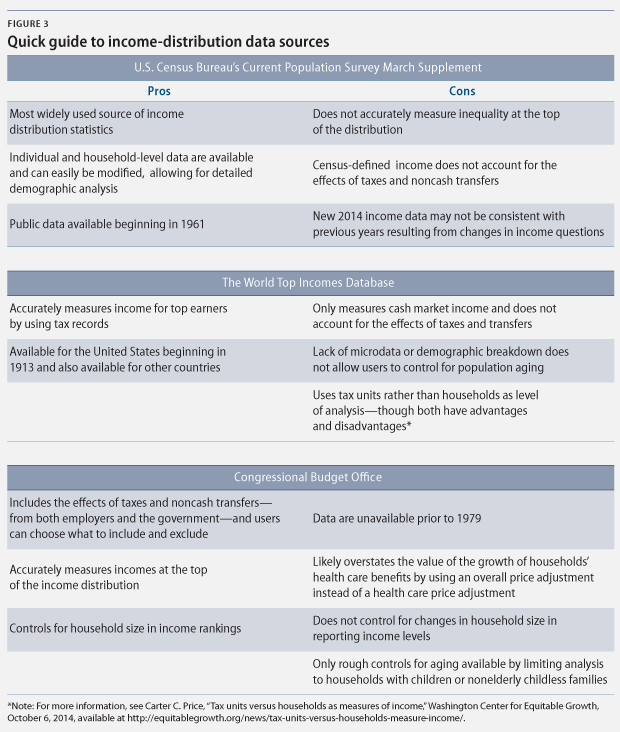 Each of the three main data sources for studying incomes—the Census; the CBO; and the World Top Incomes Database, or WTID—have their advantages and disadvantages. Using them in combination, however, there are three main facts we know about income trends. 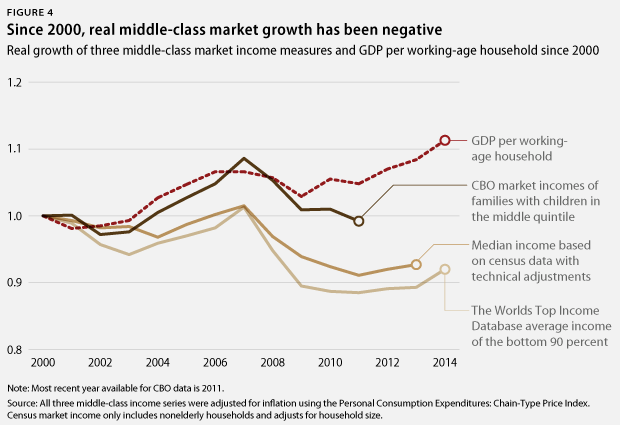 All three major data sources show a decline in real middle-class market incomes since 2000, which compares unfavorably with real growth of gross domestic product, or GDP, per working-age household over that period. The CBO data stop in 2011 and likely would show more growth if they were available up to 2014. Yet they also likely overstate middle-class market income growth because of the way the CBO calculates the real value of growing employer spending on health insurance, which counts toward market incomes. The CBO adjusts the value of health insurance using an overall inflation index instead of a health care inflation index. Since employer health insurance premiums can only buy health insurance, and since the price of health insurance has grown almost 50 percent faster than overall inflation, the real value of employer premiums likely has grown much more slowly than the CBO data show. A great deal of the economic discussion focuses on comparing the period before 1980 with the period after 1980, since that is around when the gap between productivity and median compensation exploded. 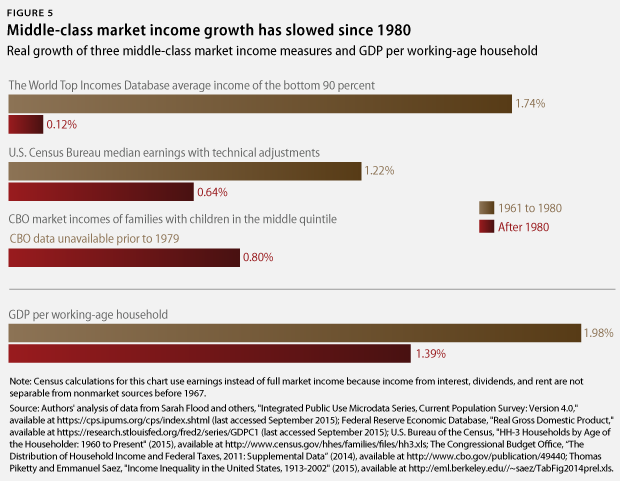 The Census and WTID data show slower middle-class market income growth after 1980. Unfortunately, the CBO’s data do not start until 1979, so they cannot help us track whether middle-class market income growth has slowed. Between 1961 and 1980, annual real middle-class market income growth was 1.74 percent according to the WTID and 1.48 percent according to the Census. In the post-1980 period, it was just 0.12, 0.64, and 0.80 percent according to WTID, Census, and CBO data sources, respectively. Notably, the Census and WTID data indicate that the gap between GDP per household and middle-class market incomes also grew between the two periods. The Census data do not accurately measure incomes at the very top, where the growth of inequality has been the strongest. Both the WTID and CBO data use federal tax records to estimate income growth, allowing them to measure income growth for the top 1 percent with much more accuracy. 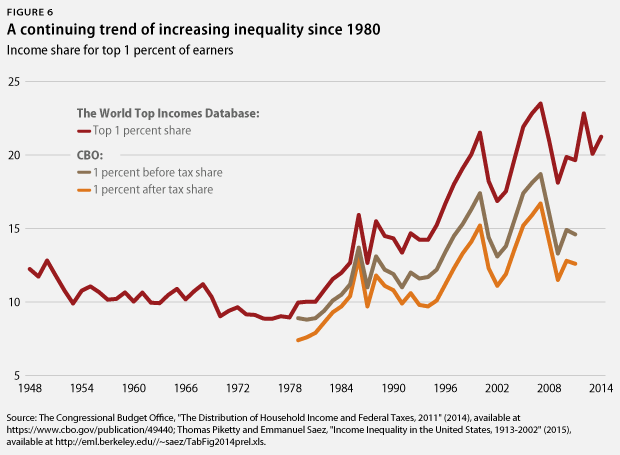 Overlaying the WTID income data with the before- and after-tax CBO income data shows considerable similarities in the levels and trends of income inequality, as measured by shares of income going to the top 1 percent between 1979 and 2011. Peaks and troughs of the income shares are well defined in both data sets and strongly correlate with economic conditions. According to the WTID, inequality remained at low levels after World War II until the 1970s. By the 1980s, it began to increase. Coincidentally and unfortunately, this is around the same time that the CBO data begin, so there is no way to determine definitively if pre-1979 income shares were consistently lower for the top 1 percent as defined by the CBO. Nevertheless, the post-1980 similarities between the two suggest that the CBO data would also show much lower inequality in previous decades. We can confidently conclude that market inequality has grown tremendously since 1980 based on both data sets. The upcoming Census release will provide important and useful new data on incomes. 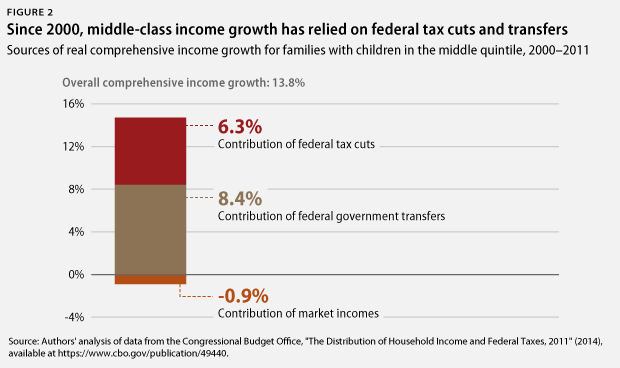 But from any angle, middle-class families have seen minimal market income increases even as the economy continues to grow. It simply is not possible to blame this fact on measurement or calculation error. Instead of trying to explain away the gaps, it is far more productive to address the policies that created them. Brendan V. Duke is a Policy Analyst for the Middle-Out Economics project at the Center for American Progress. Andrew Schwartz is a Research Associate on the Economic Policy team at the Center.